Two hundred and sixty-six years later we too can enjoy the privilege of visiting our local churchyards and reading on the headstones details of those who lie below and draw from our own reflections something of their lives and times. It is not a wasted exercise but an opportunity to think about humanity and the contributions, be they tiny or great, that each made to the community in which they lived and worked. Let me invite you to some of the informative stones and reveal what, without any specialised knowledge, can be learned by spending a few quiet moments interpreting what you see. Unfortunately, the last few decades have seen abnormal weathering and degrading of many stones, particularly those made of limestone, so they are now difficult to read and I wonder for how much longer the information inscribed on them will be available for future generations? 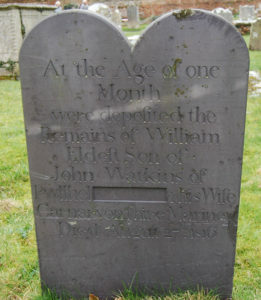 In Lymington churchyard, just north of the church is a unique slate (a durable material) headstone, with a beautifully carved inscription recording the death of William Watkins, aged just one month, who died on 27 August 1816. Further inscribed details tell us that John Watkins, the father, came from Pwllhel (Pwllheli), Caernarvonshire and that he was a mariner. You may well enquire why such a large dark grey-blue slab of stone not readily available in our area should have been selected and used for this monument? The father’s home town and occupation provides a clue. 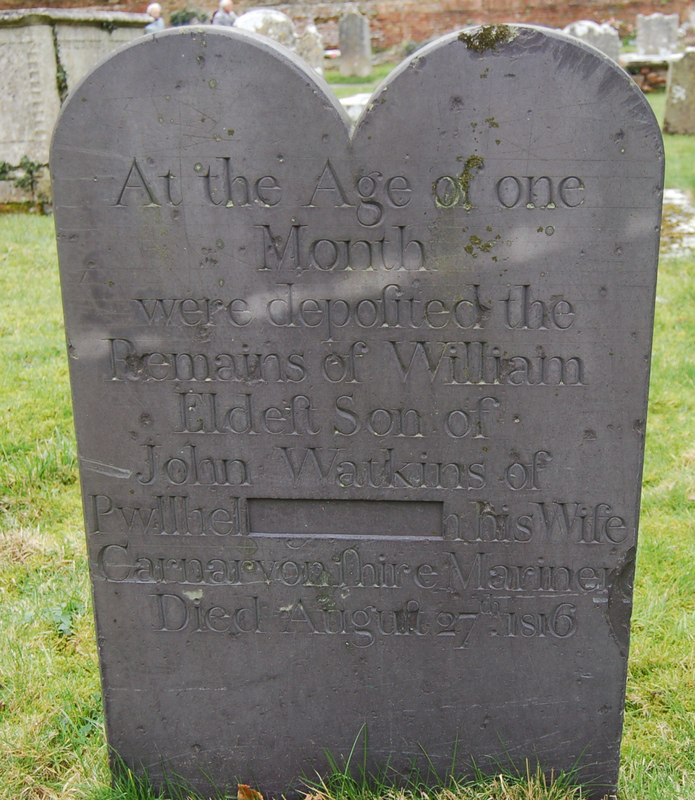 It seems highly probable that he was bringing consignments of slate from the quarries of north Wales to Lymington and that on the tragic death of his son, born in Lymington and baptised in St Thomas’s church on the 7th August, a memorial would be chosen from the cargo he was carrying. But as you gaze at this memorial stone you will be puzzled by a small rectangular area of text neatly cut from the inscription with just the letter ‘n’ surviving at the end. It is possible that the excised text bore the words, ‘and of Gwen’ his wife? But why should it have been cut out? It should be remarked at this period large shipments of slate for roofing and other domestic uses were being shipped from the Welsh quarries and mines to the numerous ports around our western and southern coasts. 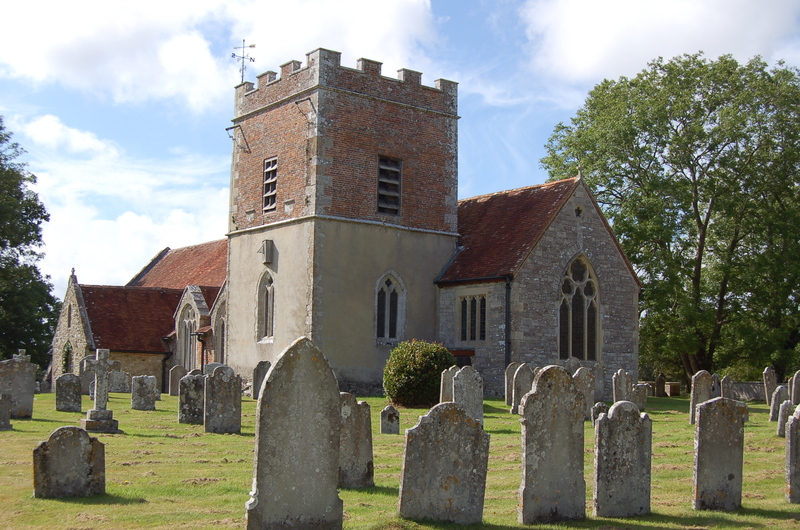 In the wonderfully peaceful graveyard around St John’s church at Boldre is a host of fine tombstones, many with fascinating inscriptions, including that of the illustrious vicar, William Gilpin who served the parish from 1777 until his death in 1804. The long carved inscription indicates that in “God’s due time” he and his wife will be raised together with their neighbours, but concludes rather strangely with the words, “Here it will be a new joy to see several of their good neighbours who now lie scattered in these sacred precincts around them.” Why several rather than all? A small headstone alongside the path leading northward from the west end of the church bears a simple but poignant inscription recording that 15 years old Charles Drodge died on 19 November 1881, by being “buried alive by the sudden foundering of gravel pit.” A salutary reminder of the dangerous work of quarrying gravel which had been a major occupation throughout our area from time immemorial well into the twentieth century. Rather different is the record of Vincent John Scott who departed this life on 17 January 1901 aged only 50 years. The Boldre villagers it appears were not going to let his simple achievements go unrecorded for posterity: “This stone was erected by his neighbours as a mark of their appreciation of his service as a postman for 23 years during which time it is computed that he walked a distance of more than six times round the world.” Does that not give pause for reflection? For goodness sake who thought of computing such a record? Is it likely to be true? ‘Round the world’—should we assume this is the largest circumference at the equator? If so this equates to 24,901 miles and multiplying by six gives a distance of about 149,400 miles (some walk! ), spread this over 23 years and we find that Vincent walked a total of around 6,500 miles a year, or about 18 miles a day (assuming he had no holidays or days off). Such esoteric information tells us something of the life of a rural postman and what a hard life it was. He was obviously extremely well known in the many hamlets that make up the large parish of Boldre and evidently a much liked and respected character in the community. Another inscription is tragic in its family listings. On the tombstone are recorded the deaths of a father, George Johnson and four of his children; Sarah, aged 10 years and 7 months and her younger brother, John Stephen, 6 years and 2 months, both died on the same day 24 August 1849, to be followed the next day by Martha, 8 years and 2 months and, just four days later, little Ann Lavinia at 3 years and 10 months joined her siblings in the grave, then a month later on 29 September their 49 years old father, husband of Betsey, died. It is very hard to try and contemplate the grief of a mother losing four such young children and her husband in little more than a month. Curiosity drove me to find out more. As the family seemed to hail from Essex (they are recorded as of the parish of Stratford) what brought them to Boldre? Here speculation, fed by historical evidence, comes into play. The worst of several cholera pandemics struck England in 1848 and 1849 claiming over 14,000 lives in and around the metropolis alone. This surely was the catalyst that drove the family to seek rural sanctuary? Cholera had a high morbidity rate and locally we have references to its consequences, for example, when Edward King (1821-85), author of ‘Old Times Revisited in Lymington’, was living with his family in London his father wrote to him from Lymington expressing relief that they had all escaped the scourge of cholera. And in a later outbreak William Allingham invited the pre-Raphaelite artist Edward Burne-Jones and his family to come and stay with him in Lymington to avoid the dreaded disease. So this seems, at least, a plausible reason for the Johnson family seeking refuge in rural Boldre. What is of particular interest is that Betsey and her surviving daughter, Elizabeth born in Leyton in 1837, made their permanent home in Pilley. Both became teachers at the village school and the daughter, in addition to her scholarly duties, played the organ in St John’s church. This brings to mind a later family tragedy marked by a tombstone set in a small kerbed plot in the churchyard of St Mary Magdalene in New Milton. In the late evening of Friday, 22 January 1943 a German aircraft released four bombs, one of which landed on a house in Vincent Road, a house in which the Morin family had taken refuge as evacuees from the frequent heavy raids on Southampton, their home town. The bomb blew the house to pieces as this newspaper reported on 30 January. Mrs Evelyn Morin lived there with her three daughters, the eldest Gabrielle born in 1931, Norma a year younger and Pauline who was aged 8. All died that night. At the time the father, Leonard Osmond Morin, was in the army serving in Italy. 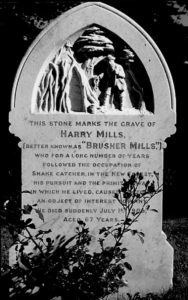 He died in Southampton in 1977, aged 73. In the lovely churchyard of Brockenhurst St Nicholas are the war graves of 93 New Zealand soldiers aligned in neat serried ranks, each with its white Portland stone headstone but amongst these is one quite different with its gothic shape. It tells of a story that fits so well with compassionate and tolerant faith of the then much loved and respected vicar, the Rev. Arthur Chambers, who served the parish for twenty years from 1899 to 1919. When the original hospital was set up in the late autumn of 1914 it was allocated for the use of Indian soldiers, mostly of Hindu persuasion who did not bury their dead but cremated them, but the headstone refers to this period: it is dedicated to Sukha. The Rev. Arthur Chambers felt it his responsibility to ensure that this unremarkable Indian, a Muslim, should not go unrecorded and initiated a fund amongst his parishioners to pay for a stone that would describe his service to the hospital to generations to come. The sum of over £5 was donated which is trifling to us today but in 1915 was sufficient to pay for the stone, the inscription and erection. To stand and read it tells the story so well. And we would do as much for our people.